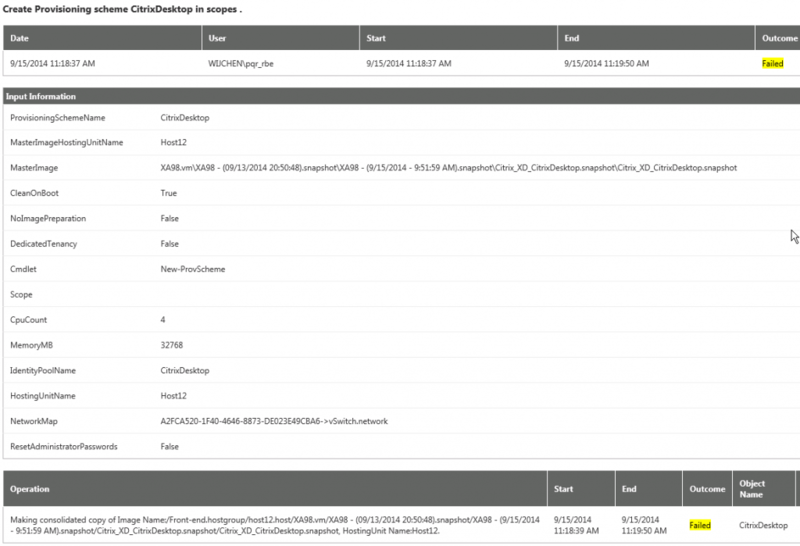 This blog will show you the issues we ran into while doing a Citrix XenApp 7.5 project with Microsoft Hyper-v 2012R2. Fusion IO local storage in front-end hosts. 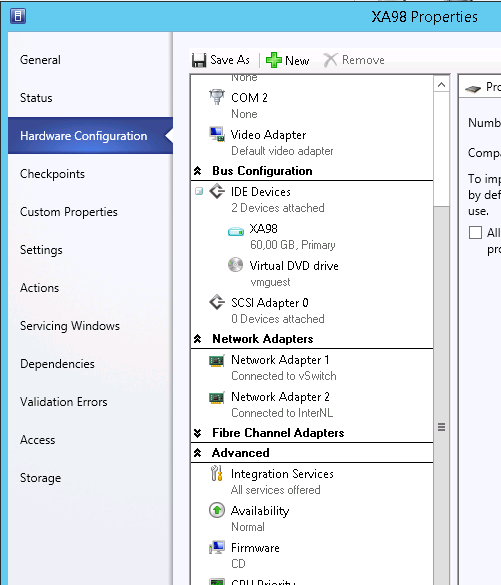 The customer chose to use Microsoft Hyper-v, we would have used VMware vSphere instead if we had the choice. The front-end hosts are setup with only local storage, FusionIO 385GB disks and do not have access to a SAN storage. While creating a new catalog we experienced the an error while setting up the catalog. the error was pretty interesting and there wasn’t a lot about it to be found a Citrix. I documented the steps that led to the error, First we select the create a catalog. I selected the deployed golden image, without selecting a snapshot. 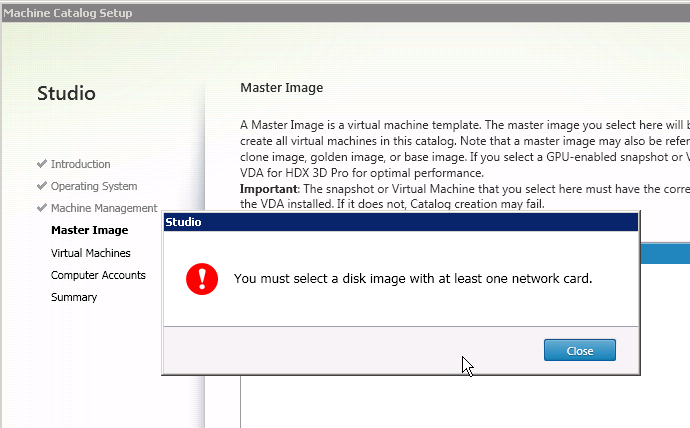 If you select only the machine Citrix will take care of the snapshot. The error occurred immediately and seems odd for sure my virtual machine has at least one network card. My golden image has two network cards perhaps that’s the issue. I also selected my other hand built virtual machine and that one worked fine. That hand built machine also had two network cards so that was weird. Looking at the golden image you see there are two network cards, one to the LAN and one to a high speed Internet connection. The later one can be dropped for we only used it to manage the updates. The issue was resolved with removing the Internet connected network card. After that the wizard ran just fine. After we cleared the first issue I thought we were good to go. Just before all this the SCVMM server was updated with a lot of lacking updates. After you update the SCVMM server you will need to update the agents. I forgot to copy the error I got but in the logging you find the error also. The error was the standard Citrix pop-up error that doesn’t show much help. Looking at the details it showed that the host wasn’t responding and needed attention. Looking at the SCVMM console and checking the hosts I noticed that there was an exclamation mark. The hosts needed an agent upgrade which hadn’t been done after updating SCVMM. This environment has been setup with local storage in the front-end hosts, this was done to provide fast desktop environments. 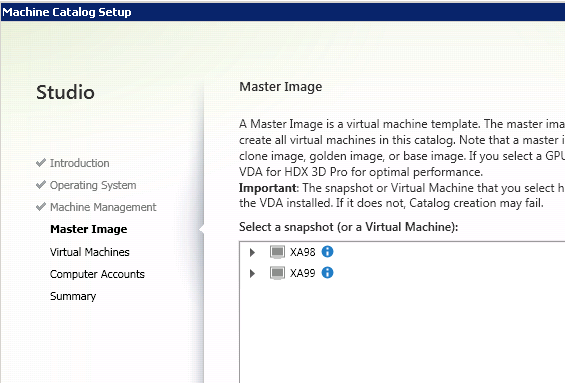 Within Studio you have to add the resources to deploy the catalogs, with four Hyper-v hosts you have four resources in studio. The challenge I now have is that we have to deploy four catalogs and combine them in one delivery group. This is far from ideal but to my knowledge the only possible way with using local storage. We deploy the golden image with Microsoft SCCM and with local storage we will need to deploy four golden images to four different hosts. 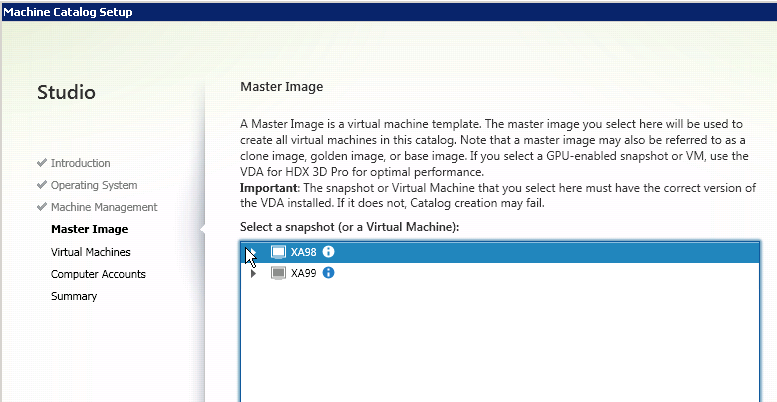 Citrix MCS needs a golden image on each resource to deploy. I’m used to work with VMware and working with Hyper-v has been a challenge for everything is done so different than expected. I encountered other things that are not issues but are weird for me. There was an issue with MAC addresses and MCS but that one is still been looked at, as soon as I have a clearer view on this I will blog about it.